Officially, Poland is the best support for the European aspirations of Ukraine and also in her conflict which now opposes her to Russia in the Crimea and the Donbass. Not always for very laudable motives besides, since at the time of the revolution of the Maidan, Jaroslaw Kaczynski and other leaders of the Polish conservative opposition, frankly acknowledged that it was for them to prevent Russia from becoming a great power, and thus to protect Poland against the imperialist ambitions of the great neighbor. But all Poles were not of the same opinion, including the right and even within the PiS, as the flags of the UPA Ukrainian demonstrators and their advocacy of Stepan Bandera awakened in the old Polish memories of the massacres of Volyn and western Galicia in 1943-44. Considered a separatist organization by the Ukrainians, the Ukrainian Insurgent Army (UPA) is perceived as a genocidal organization in Poland, and the differences in perception between the two peoples continue to fuel misunderstanding and mistrust. For it is an episode that Soviet historiography was silent about, and Ukrainians today generally ignore since Ukrainian textbooks speak only in vague and short terms about the conflict and clashes between Polish and Ukrainians in these territories. The governments of democratic Poland themselves had until recently never wanted to tackle head-on the question of the two neighboring nations recognizing the extent of the massacres, they were busy at work anchoring the new independent Ukraine to the West. It was only in July of this year, after years of lobbying by associations of families of victims and survivors, that the Polish Parliament itself has officially recognized in a resolution to the genocidal and planned Volyn massacres. Again in 2013, the Archbishop of Przemysl and President of the Conference of Polish Bishops signed a reconciliation statement with the highest dignitaries of the Ukrainian Greek Catholic Church, the Ukrainian Catholic Church and the Ukrainian Orthodox Church that called the two peoples to mutual forgiveness. If this statement was considered necessary by some, others considered it too “politically correct”. An example of the latter was the case of Father Isakowicz-Zaleski, historian and former opponent of the communist regime, who fought for years for recognition of the genocidal massacres committed by the UPA against the Poles. Actually this statement gave reason to the Ukrainians, who usually minimize the extent of the massacres committed by the UPA, and put them on par with the atrocities committed by Poles against the Ukrainians. Certainly, the list of historical wounds goes back further than World War II. Without going into the time of the Republic of Two Nations of the late eighteenth century which united the Kingdom of Poland and the Grand Duchy of Lithuania with a territory that covered much of present-day Ukraine, the 1920s and ’30s have seen poison relations between the Second Polish Republic and the Ukrainian minority who were around 5 million people out of about 35 million. Poles remember the terrorist acts of the OUN, the Organization of Ukrainian Nationalists. Ukrainians remember the burned Orthodox churches, villages razed on suspicion of hiding rebels, the internment camp Bereza Kartuska, etc. Even before the war, Ukrainian independentists, stuck between a Polish and a Soviet state hostile to the independence of Ukraine, turned to Germany, which partly explains why the Germans were welcomed by some Ukrainians as liberators when they chased the Soviets in 1941 and why there were so many Ukrainians fighting alongside Nazi Germany during the Second World war. Between 1942 and 1944, the UPA was the military arm of the OUN and wanted to prepare the future independence of Ukraine by depopulating territories of Western Volyn and Galicia of their Polish inhabitants. For Jews, the UPA was content to adopt a neutral attitude in front of the genocide perpetrated by the Germans before finding that the problem of the Jewish minority had ceased to exist. The UPA therefore was turned against the Poles in 1943. Some of its members had, in the year before, in uniforms of the Ukranian police, assisted Germans in the extermination of Jews before joining the Rows of UPA in early 1943. The Institute of National Remembrance (IPN) considers the Polish village massacre of Parośla Pierwsza as the first of a long series of organized and planned genocidal massacres. 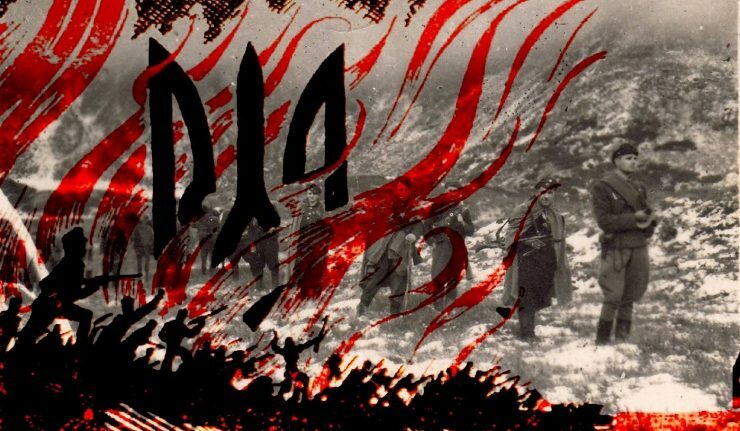 In the first village, a UPA unit had murdered 173 Poles on February 9th, 1943. In March and April, other villages were “cleansed” of their Polish inhabitants at the price of hundreds of innocent victims. In early July, the villages that saw their inhabitants massacred by UPA units and Ukrainian peasants groups already had to count in tens as the bloody wave gradually moved from east to west, gathering thousands of victims of all ages. On Sunday, July 11, 1943, the UPA units launched coordinated attacks against 99 Polish cities. After preventing surrounding villages from any leakage of inhabitants, they launched the massacre and destruction. An action planned several days before launching the UPA united Ukrainian peasants, explained the need to destroy all Poles living in the region. The killers used guns, axes, pitchforks, scythes, saws, knives, hammers and other tools, and they spared not even the children who were also killed with extreme cruelty. This coordinated operation lasted until July 16th, but the massacres still continued. Only in July 1943, 530 Polish villages were emptied of their inhabitants and burned. Everywhere, only a minority managed to escape. A new wave of massacres took place in early 1944 when, taking advantage of the withdrawal of the German army facing the Red Army, the UPA units and OUN’s groups attacked refuge-seeking Poles in villages, like at the monastery of Wiśniowiec (Vyshnivets) where an armed group of the OUN massacred 300 Poles who had sought refuge there. The IPN estimates the number of Poles who died in the massacres of Volyn and western Galicia to be over 100,000. Others who had fled or managed to stay by combining self-defense groups or those who had lived in large cities where the UPA did not venture, had to leave after the war to the westward swipe of Poland agreed at Yalta. This is why Western Ukraine today has very few Poles. The late Polish President Lech Kaczyński said that the Popular Republic of Poland was built on the lie of Katyn and a democratic Poland had to be rebuilt on truth. The Communist lie collapsed in this part of the world with the fall of the Berlin Wall in 1989-90, but much more is needed in the region to revive a truth hidden for nearly fifty years. Unfortunately, in this effort of truth and recognition, survivors of massacres Volyn and western Galicia have long felt abandoned by the Third Polish Republic as, during the genocide, they felt inadequately defended by the Polish government in exile and its Army Interior AK. Today, seeing constant reference to the resolution of this issue merely pushes the Ukrainian denial and also a concerning resurgence of, especially in western Ukraine, a nationalism that refers to a genocidal organization. Poles have decided, while continuing to support Ukrainian aspirations towards Russia, to call a genocide a genocide. If Ukraine does not lose her main support in the region, she will have to learn to deal with her history and to draw conclusions for the future. It will not be sufficient to propose again to the Poles to forgive and to ask for forgiveness, as did President Petro Poroshenko in 2013, and to warn against the political exploitation that may be made of the resolution with the Polish Diete. Because that way, the Ukrainian President, who laid a wreath of flowers at a monument to the victims of the massacres Volyn and western Galicia during his state visit to Warsaw in early July, continues to deny the extent and the special character of these barbaric killings planned long before World war II. Ukrainian nationalists have called in their papers for the elimination of all foreign elements (Poles, Jews, Czechs …) present in the territories they claimed as Ukrainian, and also of all Ukrainians who did not support their ultra-nationalist ideology. The Ukrainian authorities seem to be so condescending towards Poland because they seem to believe they have a strong backing by Canada (where there is a big Ukrainian diaspora) and by Germany (Ukraine was Nazi Germany’s ally during WWII, but also during WWI Ukrainians supported Germany and Austria, hoping they would help create a Ukrainian state). Also Britain and the US seem to be involved in some shady deals with the Ukrainian government against Russia. Ukrainians seem to believe Germany, Canada, Britain, the US and Israel will help make Ukraine the strongest country in the region, a regional power. The vast majority of Poles I’ve spoken to have a negative attitude towards Ukraine because of its lack of remorse for the 1940s genocide of Poles. And are upset by the leading Polish politicians’ unconditional support for Ukraine, including Poland’s taking in big numbers of Ukrainian immigrants. In recent months, diplomatic conflicts between Poland and Ukraine have become main political events in Eastern Europe. Despite the close economic ties and a long-term history of relations between these two countries, Warsaw and Kiev keep difference of principle if speaking of some historic and territory-related matters. Activities of Ukrainian Insurgent Army (UPA) have become a sticking point in the disputes of Ukrainian and Polish politicians. According to Ukrainian historians, UPA was struggling for maintenance of Ukrainian statesmanship. Speaking from Polish point of view, the OUN-UPA militants were war criminals, who carried out genocide of Polish population in Volhynia. … And now, just imagine: Ukraine is going to sue Jarosław Kaczyński at the International Court of Justice!